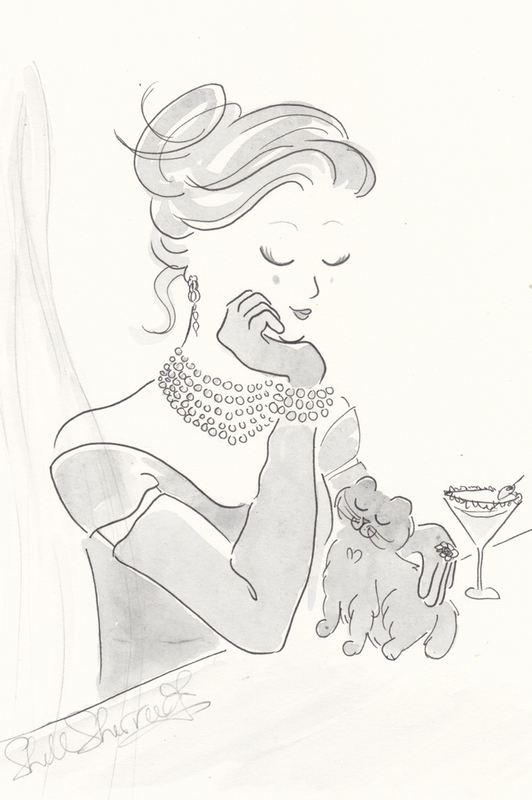 Source of beautiful inspiration for today's illustration: Danielle of VenetiaMicio ~ merci, grazie mille, thank you. It has your customary beautiful delicacy - it's hard to make red and pink look well together but your dignified aged red is perfect. When you branch into fashion design I shall wear only your garments. Margaret, Venice is only an hour west of you. ShSh, I was passing thru Aussieland & landed in Venice! 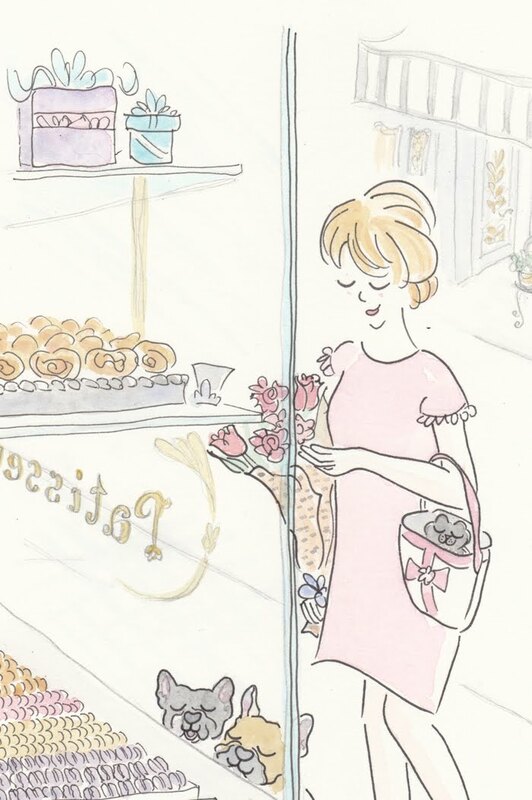 You just mentioned two things I love... gelato and prosecco! Well, I always love your art. 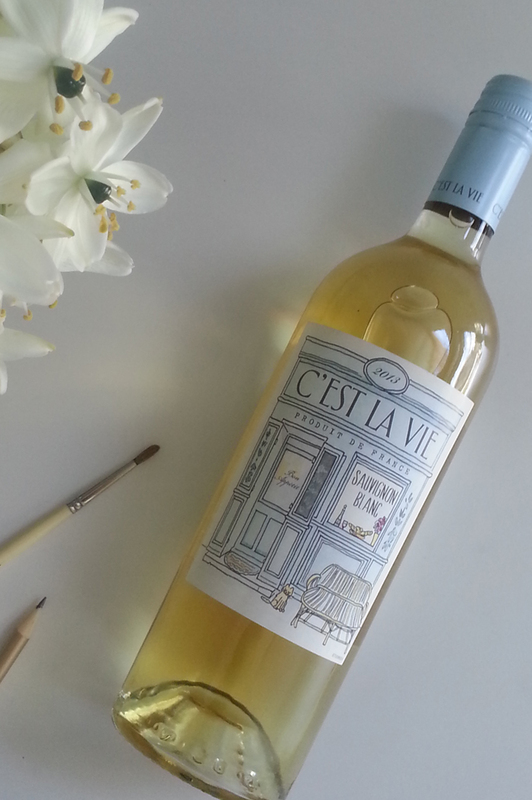 Danielle's VenetiaMicio is truly a source of inspiration and her website is rich in images. All colors in the ledger should be allowed to marry. And mix. And match. And generally behave as though they haven't a care in the world. This illo is proof of that. I'm way beyond willing to buy into any fantasy that includes Venice, a certain dancing man, prosecco—and your gorgeous color palette! The icing on this torta: I love this quiet and essentially untouristed part of Venice, so thanks for the return visit, cara. On, what timing. This week I stumbled across a journal I kept on my first trip to Venice. Was going to quote a passage here, one which struck me as sweet, funny, and racy, then thought perhaps not. 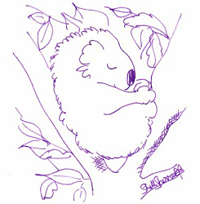 But thank you for the lovely illo. Thank you, Favourite Vintage Finds ~ wishing you a lovely weekend filled with Brrrts. Mise ~ I promise to send you a prototype fashioned from paper tissue, doilies and vintage wallpaper for your most valued opinion. Thanks, dkshopgirl. Looks like we've had our last cold snap ~ spring has sprung. Cafe ~ teleportation is still high on my wish list. Happy snacks. Cali ~ I feel like the UN today. ;) What a wonderful philosophy. You're more than welcome, dear Alexa. Between you and Danielle, we have two of the best Venice guides imaginable. Hiker ~ way to pique my curiosity! With your gift of expression, I'm sure it's all of those things and more. Your palette makes the world a sweeter place, Shell. And our furry feline friend floating by doesn't hurt. Charming as always. Pour me a glass of Prosecco and let me float in this beautiful scene the whole weekend! Your vision of gelati is pure delight - and calorie free! Thanks, Susan! I had a feeling you'd spot the kitty. Katie ~ *splish splash* *clink* A little R&R before your trip. And yes, no calories. Handy when much pastry consumption is just around the corner. You're always welcome, Yvonne. I hope you're having a lovely weekend, bella. Yesterday I went to a dedication of a watercolor illustrator, and I thought a lot about you, because it's very pretty. I have for many years one of his sketchbooks, a trip to Venice. She has traveled extensively and has more than 70 books. 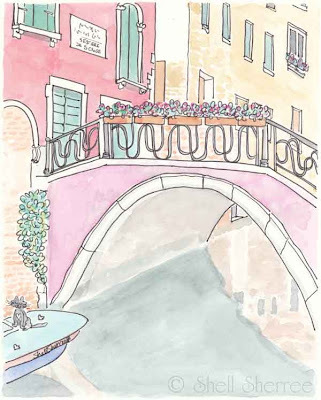 Bravo pour ta nouvelle aquarelle, toute mignonne et jolie de ce coin de Venise que j'adore, sans oublier the lovely kitty ! Ella or Micio ? Danielle ~ I'm extremely honoured that you thought of me when seeing Lizzie's work. It's very beautiful! She must be young of heart, I feel. Je suis très heureuse que tu aime bien cette aquarelle. C'est ton Micio, avec un peu de blanc dans sa fourrure. Bisous, ma chère. Between the HIker's latest and this beautiful rendering, I think I need to go to Venice! Virginia ~ Meeps is racking up the frequent flyer points! This is so beautiful. 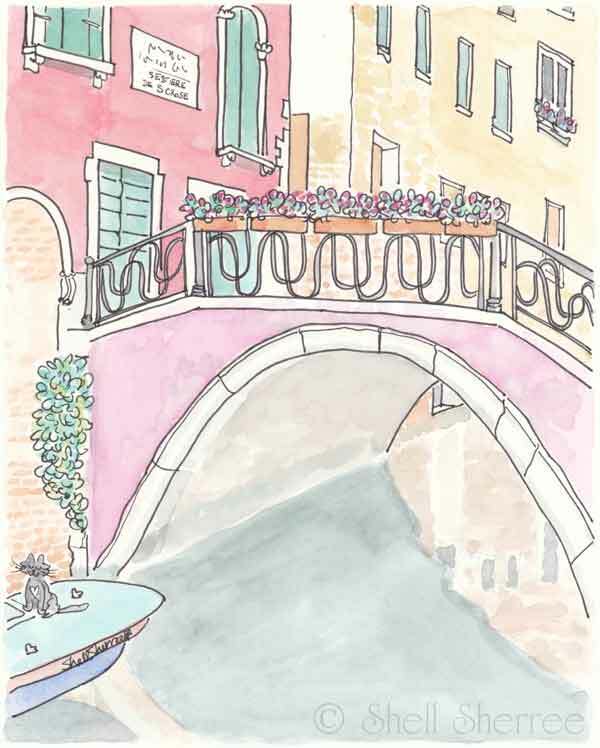 I think it's time for you to make up a set of Venetian notecards! I'm really enjoying my Parisian ones.